• “Life As Reading: The Interpretative Situation of Razumov, the Hero of Under Western Eyes.” Yearbook of Conrad Studies. Issue 12 (October 2018). • “The Theme of Patriotism In ‘Prince Roman’. 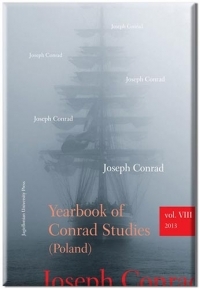 “ Yearbook of Conrad Studies. Issue 12 (October 2018). • “Colonialism in the French Quarter: Tennessee Williams and Joseph Conrad.” Southern Quarterly. Vol. 50. No. 2 (Winter 2013). Print: 108-22. • review: Joseph Conrad by Tim Middleton. Series: Routlege Guides to Literature. London-New York: Routledge, 2006. Joseph Conrad Today. Publication of the Joseph Conrad Society of America. Vol. XXXVII. No. 2 (2013): 10-11. VIII. “Powrót ojca. Studia na WSNS” (Father’s Return. Studies at WSNS). Debata #11/134 (November 2018). Print: 24-27. VII. “Olsztyński październik” (October 1956 in Olsztyn). Debata #9/132 (September 2018). Print: 21-25. VI. “Powrót do Polski” (Return to Poland). Debata #8/131 (August 2018). Print: 25-27. V. “Przeprowadzka na Ukrainę. Zofia-konsul. (Moving to Ukraine. Zofia-Consul). Debata #7/130 (July 2018). Print: 21-24. IV. “Życie na zesłaniu w Kazachstanie” (Life in Exile in Kazakhstan). Debata #6/129 (June 2018). Print: 23-25. III. “Wspomnienia z dzieciństwa” 3 (Memories from Childhood 3). Debata #5/128 (May 2018). Print: 19-22. II. “Wspomnienia z dzieciństwa” 2 (Memories from Childhood 2). Debata #4/127 (April 2018). Print: 24-27. I. “Wspomnienia z dzieciństwa” 1 (Memories from Childhood 1). Debata #3/126 (March 2018). Print: 26-28. • Reading God’s Handwriting : Poems by Philip C. Kolin. Kaufman Publishing: St. Simons Island, 2012. Religion And The Arts. Vol. 17. Issue 3 (2013): 314-17. • Still Some Cake by James Cummins. Carnegie Mellon UP, 2011. NewPages (10/01/12). Online. • Poetry. Vol. 199. No. 2 (November 2011). NewPages (12/16/11). Online. • Beloit Poetry Journal: The Logic of Yoo. Vol. 62. No. 1 (Fall 2011). NewPages (11/15/11). Online. • “I like,” “the rules”—bilingual; “Poet Watching The Satellites,” “Mr. Smith’s Answer,” “The Day I Became An American,” and 8 reprints. Willow Review. Vol. XLIII (Spring 2016). Print: 12-26. • “denial,” “the Unseen,” “why am i here.” Olentangy Review (December 2014). Online. • “Salvation,” “Untitled.” Tipton Poetry Journal. Issue 26 (Fall 2014). Print: 42-3. • “Vibrations.” Adanna Literary Journal. Issue # 4 (2014). Print: 43. • “Mother.” Poetry Nook Magazine. Vol. 4 (2014). Print: 8. • “The End of the World.” Off The Coast. Vol. XIX. No. 1 (Winter 2013). Print: 16. • “The Birds,” “Cupboards,” “Joseph Conrad,” “Indian Summer.” Apple Valley Review (Fall 2012). Online. • “Inclusion.” Christianity and Literature. 59/1 (Autumn 2009). Print: 175. • “A Sunday Mass at St. Jacob’s,” “A World Without Honey.” Oklahoma Review. Vol. 11. No. 1 (02/10). Online. • “It,” “Near”—bilingual. Bateau. Vol. 3. No. 2 (06/10). Print: 18-21. • “Nothing.” International Poetry Review. Vol. XXXV. No. 2 (Fall 2009). Print: 83. • “Przekład” (Rendition). Kultura : Paris. No. 11/566 (11/94). Print: 51-2.